As an adaptable willow, the Babylonica Weeping Willow Trees will thrive in most soil types. You will find this Weeping Willow a hardy grower with gracefully rounded crown to about 50 feet in height with a spread just as wide. An excellent fast growing tree! This Willow Weeping has bark is dark gray and deeply furrowed. It is one of the most popular willow trees. 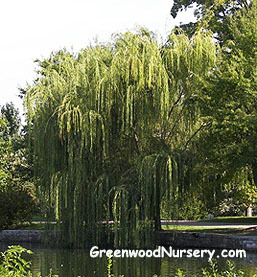 The Babylonica is a Greenwood customer favorite of willow trees.